It is a challenge to describe subtle energetic interactions like the energy connection we make with a horse. Putting it into words seems like an important part of knowing where you really are with a relationship though. I think that we are very good at deceiving ourselves when it comes to our energy connection with animals, mainly because we would like to have a genuine connection based on mutual affection and trust, but we struggle to express those things and quickly look to replace them with something else. I think the best way to tell what you really have with a horse is to feel it, to educate yourself in your sensory perception skills so that you can become sensitive to your own energy, the energy of the horse, and the flow between you both - the energy connection. I find that when a horse is experiencing tension, from an internal or an external source, it is not possible to 'connect' with them. That connection is a feeling of sticking to the horse with your energy. Tense horses have a hard and shiny shell to their energy, and they repel any advances you make. This is quite obvious on a purely physical level, for example they will often be sensitive and distracted if you try to touch them, they might ignore you or seek to move away. They might feel hard in their muscles and unresponsive. Energetically they feel like a vacuum, always receding and difficult to reach. Often trainers will use the energy that tension creates in a horse as stimulation - the horse goes forward and they take advantage of that. There is no energetic connection in this kind of work though, and continuing to profit from it will only increase the separation between you. If a horse is tense and distracted, the best thing you can do is to wait and emit calm and grounded energy until the horse begins to slow down, stop and listen. Eventually they will no longer respond to whatever is triggering their anxiety, and if you are providing a safe zone with your energy, they will gradually soften that hard shell and become more and more receptive. A receptive horse feels more solid, more fluid and more malleable. It is as if they become more like Plasticine, and the yielding nature of Plasticine is in alignment with how possible it becomes to introduce straightness. It has nothing to do with inducing them to 'do' something, and everything to do with allowing them to 'be' something. First you listen and wait, melting your own hard shell and allowing them in, becoming yielding and soft yourself until they begin to match that, and then you can 'connect'. Then it is possible to develop the static connection into a dynamic one. There is no value judgment attached to 'static' or 'dynamic'. A static connection is where you would work from if you wanted to do a healing session, or just have quality time with your horse. 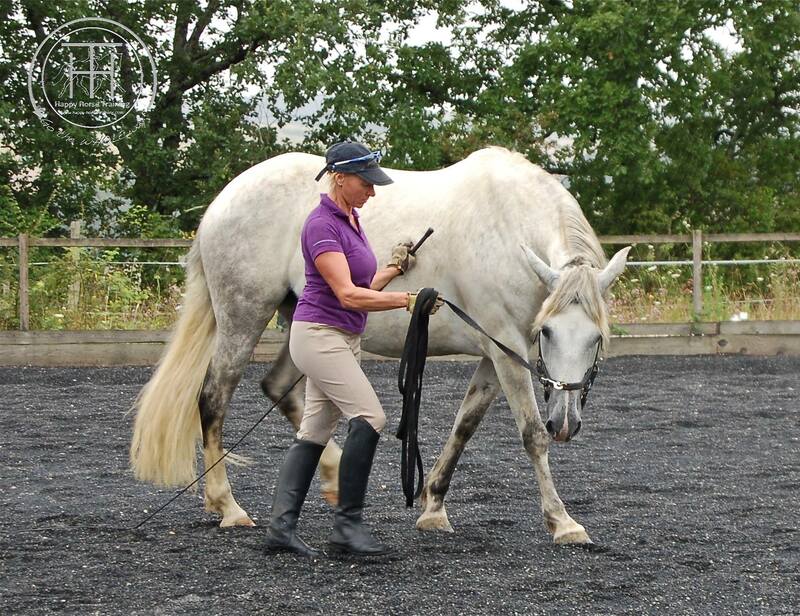 The dynamic connection is bringing movement in, and maintaining the energetic engagement by encouraging the horse to adjust their body in a way that channels their movement, allowing it to flow yet stay in balance. The more the horse discovers and appreciates that flow, the more their energy softens and reaches a marshmallow-like texture. You can feel this when riding a horse too, when their sides become spongy and accepting and they open up their diaphragm and breathe. Our energy connection with the horse when we are riding is every bit as important as when we are working with the horse on the ground. This feels like a genuine relationship to me, because we are bonding in a real way. The bond is a physical/energetic reality, and it feels good and is based on trust because trusting is the very first condition. First in oneself and then in the horse. Nothing happens without trust. It isn't the same thing as being able to initiate a particular behaviour in a horse i.e being the magician with the wand. In that scenario there is always a master and a servant, a creator and an executor, a conductor and the orchestra... and so there must be a fundamental divide between the human and the horse. That is not without creativity, or necessarily wrong, but it is a different thing to seek to come closer to the horse, to become one with their energy and make a team. Two parts working together to form one function. It is so fulfilling because you are no longer alone up there in command, but sharing, connecting and feeling mutual love and togetherness.